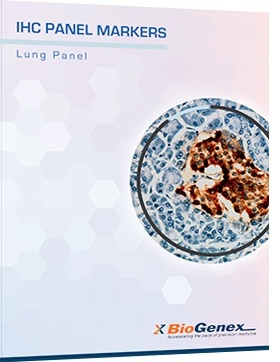 BioGenex lung IHC Panel Markers include specific antibodies useful for the analysis of lung tissues. The panel is meant to help customer easily find appropriate antibodies for their testing. All BioGenex primary antibodies are quality controlled and tested to provide optimum immunohistochemical staining when used with the appropriate BioGenex detection system. The correct optimization of antibody and detection system minimizes the potential for false negative or false positive staining. This antibody recognizes a protein of 31.5kDa, identified as Calretinin. Calretinin is an intracellular calcium-binding protein belonging to the troponin C superfamily characterized by a structural motif described as the EF-hand domain. The mitotically active basal layers of most stratified squamous epithelia express 10% to 30% of their total protein as keratin. The two keratins specifically expressed in these cells are the type II keratin CK5 and its corresponding partner, type I keratin CK14, both of which are essential for the formation of 8-nm filaments. Epidermal growth factor receptor (EGFR) is a 170 kDa transmembrane glycoprotein receptor tyrosine kinase that, activated by epidermal growth factor (EGF), affects cell growth and differentiation. Binding of EGF or TGF alpha to EGFR activates tyrosine kinase activity of the receptor.